Extended Summer Gopinath's Kids Camp - August 7 - 9, 2014! ~ The Toronto Hare Krishna Temple! 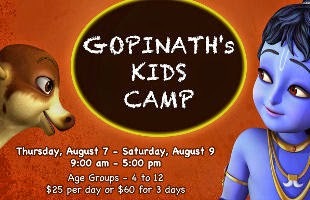 Extended Summer Gopinath's Kids Camp - August 7 - 9, 2014! Imagine a day full of games, laughter, delicious prasadam, chance to make new friends and especially, NO PARENTS! 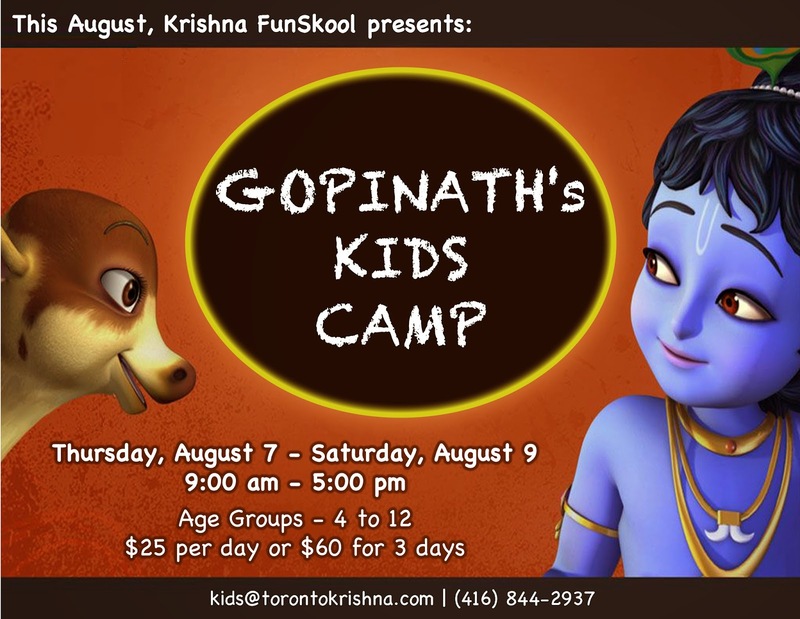 ISKCON Toronto is providing just that and more for the younger members of our community with the 8th Annual Gopinath's Kids Camp! This year, the 8th Annual Gopinath's Kids Camp will be held from Thursday, August 7th to Saturday, August 9th from 9:00am - 5:00pm, strictly for kids aged 4-12 years. We are extending our annual one-day camp to a three-day camp and it will provide an opportunity to ignite the spiritual spark in our children while doing fun and interactive activities that they enjoy. In addition to outdoor games, some of the primary activities being planned for the day are a Mega Scavenger Hunt, fun cooking classes, learning how to play different musical instruments, sumptuous prasadam and many fond memories. All this and much more for registration fees of only $25 per day or $60 for all three days! You can register at the temple or use our online form by clicking here (last day to register is August 5th). For further information, please don't hesitate to email us at kids@torontokrishna.com.